These free DIY dog house plans will make sure that your dog has a safe haven from the weather and you can take pride that you built it just for them. Dog houses are fairly simple projects and can be usually be completed by someone with just basic building skills. They'll take anywhere from half a day to a few days to complete and can easily be done in under $100. Before using these free dog house plans to build your dog's dream home, make sure that it will be the right fit for the size of your full-grown dog. Some of these dog house plans can even be customized to fit any size of a dog so be sure to look for instructions within the plans for that. If you're looking for more free woodworking plans like these free dog house plans, you'll want to check out the free shed plans, cat tree plans, rabbit hutch plans, playhouse plans, birdhouse plans, pergola plans, porch swing plans, greenhouse plans, bookcase plans, wine rack plans, coffee table plans, tree house plans, workbench plans, picnic table plans, gazebo plans, deck plans, and chicken coop plans available. Lowe's has an excellent free dog house plan for a great-looking yet simple dog house that will make the perfect home for an average sized dog. You'll find a tools and materials list, an overview, cutting directions, and building instructions with illustrations. This is a basic dog house plan that's not only easy to build but the finished dog house will look great in your yard. It can be built in less than half a day and you won't spend over $100 for the materials. There's no guesswork when you build this dog house either, blueprints, a material list, step-by-step instructions, and even videos are provided for this free dog house plan. The House of Wood has a free dog house plan that has a deck, toy box, and place for food and water. You'll need to sign up for their free newsletter to get the plans and you'll be emailed a PDF with a materials list, tools list, cut list, diagrams, and step-by-step building instructions. Over at Wood Shop Diaries, you can find more tips, photos, and even a walkthrough video to help you complete this quick and easy project. This standard dog house plan from BuildEazy includes comments and photos from people just like you who have built this dog house. Within the free dog house plan, you'll find a materials list, cutting list, building instructions, and blueprints. Add some character to the dog house you plan to build with this free plan for a crooked dog house. Ana White will take you through the steps with lots of photos, diagrams, and instructions so you can quickly and easily build this dog house. Use plywood and pallets to create this one-of-a-kind dog house that will keep your pooch safe and warm. Written directions and color photos help you put it all together. Looking to give your pooch the luxury he deserves? Then why not try your hand at this free dog house plan for a ranch style doghouse. Use the diagrams, images, materials list, and instructions to build this one-of-a-kind doghouse. Here's a free DIY dog house plan that includes a porch created by extending the base of the dog house. Your pup will love being able to hang out and enjoy the fresh air when the weather is nice. Color photos and step-by-step directions will help you build this simple doghouse over the weekend. The finished dog house that you'll get after completing this free dog house plan is for a 9-foot base house that will be perfect for a small to medium-sized dog. It can even be built for under $75! Photos and blueprints will take you through each step of this free dog house plan until you've gotten the finished project just like you've been looking for. I know this technically isn't a dog house, but this indoor dog kennel that doubles as an end table is a great solution for a small dog that stays indoors. There are photos, diagrams, and written instructions that will help you build this for your dog. Looking for a dog house plan that's a little more unique? This free doghouse plan from DIY Network is for a log cabin doghouse. Print the materials and tools list, step-by-step instructions, and photos to get this doghouse built. 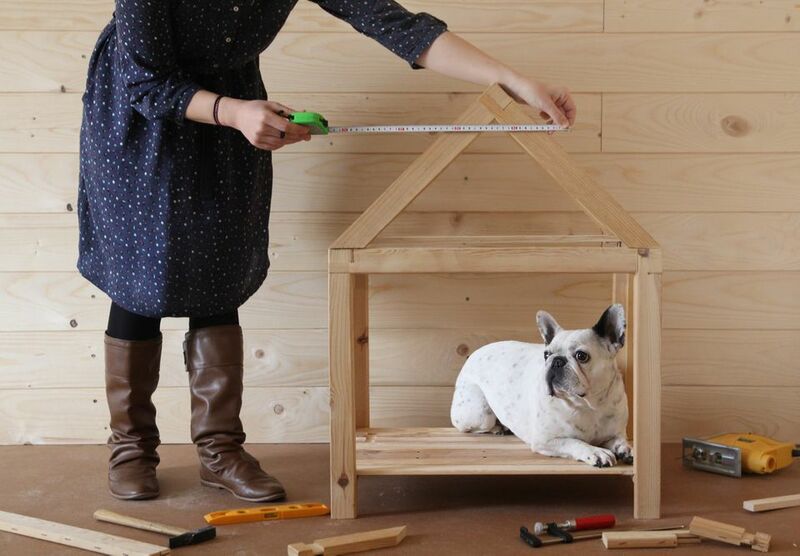 Here's an adorable dog house plan that would look great anywhere in your yard. There's a shopping list, tool list, instructions, and diagrams to help you build this. Over at Instructables, you can find a free plan for a mobile dog house that's easy to move so you can set it up wherever you go. There's a shopping list, tool list, color photos, and building instructions. My Outdoor Plans has a free doghouse plan for a simple doghouse that you can build in just one weekend from 2x4s and 2x2s. Tons of diagrams and instructions are all included in this free doghouse plan. This dog house can be built to fit any sized dog, small to large, and is insulated to keep your dog warm. This is a great all around dog house plan that even a beginner can handle. This free dog house plan has videos to go along with each building step as well as lots of blueprints showing the different angles of the dog house. This free dog house plan, named the Sparky1, is a simple dog house that's made from inexpensive and recycled basic building materials. There are insulated floors, a removable roof, a cedar deck, and an optional inner wall. Download the free dog house plan that includes drawings, a material list, and building instructions. This free dog house plan will help you build a well-ventilated sturdy home for your medium sized dog.